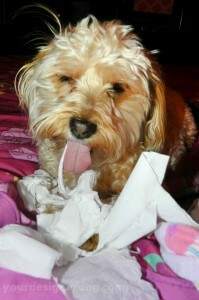 Sadie has gone #TongueOut today after some hard work destroying those tissues. I like to let her indulge in a little harmless mischief once in a while to get those destructive urges out of her system and she always has a blast going crazy with the tissues. P.S. – Sorry for the short post, but I’ve been dealing with some technical issues (Maybe you’ve noticed the random streaky line that appeared on the blog’s homepage?). Hopefully I’ll get everything looking better than ever soon.